Are you in search for moving and storage service? Moving can be very a strenuous experience especially when you have to make a long distance move. However, the process of relocation can be made simple with the help of reliable moving and storage company like South Florida Van Lines. South Florida Van Lines moving and storage service is a full-service moving company based in Miami, Florida. We offer reliable residential and commercial moving services as well as affordable storage solutions to the residents of South Florida. Whether you are looking for a short distance move, long distance move, self-storage solutions, or both moving and storage services, South Florida Van Lines puts you in control. We have specialized air conditioned storage facilities to help you store your valued belongings safely and securely. We bring our moving truck unit right at your door and load all the belongings you need to store and move. Tell us when to pick up your belongings and we will do the rest. Whether you are making a short distance residential move or a long distance commercial move, we will do our best to make the process easier and stress-free. We will do all the driving and deliver your belongings to your new location safe and sound. Our reliable and convenient moving and storage services allow you to relocate without hassle. With us, you can take all the time you need to pack/unpack, load/unload your belongings, without the troubles of worrying about late fees, truck rentals, etc. Our staff is experienced and well trained in making your moving experience smooth and convenient. 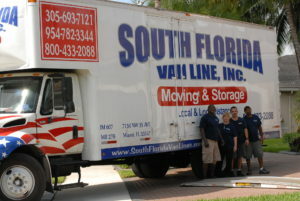 Trust the experienced staff at South Florida Van Lines for your local move. Local moving is the core of our services. We have the years of experience required to move thousands of clients all around the country. Among local movers, South Florida Van Lines is well-known for helping clients relocate to new places more securely and more easily. All our agents and employees fully insured and licensed. Whether you want to relocate to a new state or another country, we can help you with our professional moving service. When you hire our services, you get a trusted partner that will help you throughout your long distance move and make sure that you have a stress-free moving experience. Wherever you go, South Florida Van Lines is there to help you make a successful move. We specialize in furniture moving. 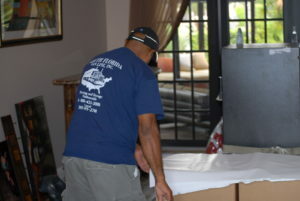 We have skilled and experienced professionals who know what it takes to move large and fragile furniture safely. We have the right tools to disassemble and assemble your furniture. We employ the best furniture movers to make sure that the handling and transport of your furniture is smooth and successful. Whether handling a metal folding chair or a mahogany armoire, we follow special procedures to protect every item in our care. South Florida Van Lines has some of the most secure, flexible, and affordable storage options available for you. Whether you want short-term temporary storage or a long-term permanent storage solution, we’ve got you covered. We maintain secure warehouses across Florida for long-term storage solutions. All our storage facilities are regularly inspected to make sure that they meet our standards for security, safety, and cleanliness.